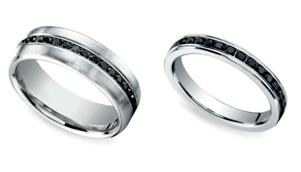 Matching wedding bands symbolize unity and partnership. While past renditions of matching bands included simple rings of gold or platinum, today’s couples can incorporate unique details in their rings for an updated design twist. Use scroll work, interlocking puzzle piece details, or other personalized touches to design your own unique matching wedding bands. Need inspiration? Check out these 10 amazing and unique matching wedding band sets from our collection. A heart is a literal representation of love. 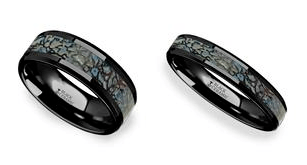 Matching bands etched with half of a heart pattern showcase the symbolic joining of two individuals becoming one through the unity of marriage. When these rings are joined, the heart—and the bond—is complete. Choose your rings in classic yellow gold, or for a more contemporary styling, opt for white gold or platinum. Set these rings in rose gold for a flush of romance. This heartfelt pattern can also incorporate diamond accents or birthstones to add spark or to showcase a personalized appeal. 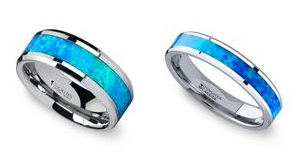 While both bands can be set in the same metal hue, his or her ring may also feature a contrasting metal as not all couples want their rings to be an exact match. 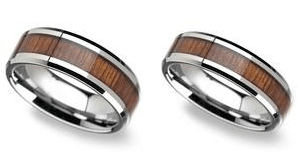 Couples who love the outdoors may gravitate toward matching rings that feature inlays inspired by nature. 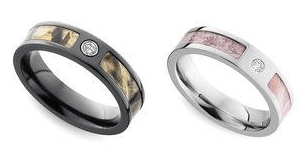 Choose his and her rings with a camo inlay—classic camo for him, pink for her. His ring may incorporate a darker metal or select a matching metal for both rings. A center round brilliant diamond draws the eye to the ring and adds fire to the setting. 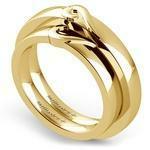 Style goes Jurassic when couples design matching wedding bands that incorporate prehistoric dinosaur bone. This inlay material creates a multidimensional accent, and, when set within black ceramic, the rich multi-hued dinosaur bone pops against the darkness. Unique matching wedding bands can pull materials directly from nature for a sustainable interpretation of a classic band. Koa wood is indigenous to Hawaii, and this material is an ideal inlay for the couple that loves the surf…or the beauty of paradise. Design both bands in silver-hued Tungsten, and choose a smaller width for her—4 millimeters is perfect! Choose rings that mirror each other in every way—with a glint of spark, of course! 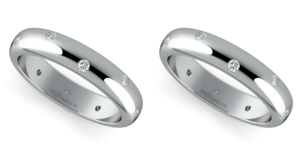 Simple domed platinum bands elevate the elegance with inset round diamonds throughout the band. While platinum is a luxe choice, you also can design these bands in yellow, white or rose gold! 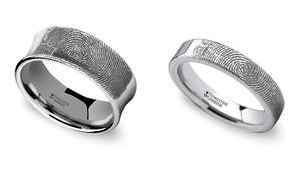 White-hued Tungsten creates the backdrop for the ideal imprint—a literal ‘personal touch.’ Add your partner’s fingerprint to a simple band for a one-of-a-kind detail that seals your vows with his or her touch. White diamonds are a classic touch for any ring, but when you want a more contemporary and modern touch, opt for black diamonds. His band includes a seamless center row of dark diamonds, and her ring features an infinity design of the same dark detail. A cool hued metal accentuates the black velvet appeal of these dark diamonds. 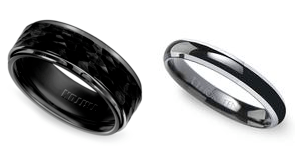 Black Tungsten creates the perfect black background for a simple, yet stylish design for unique matching band sets. These rings don’t have to mirror each other; his ring can feature a hammered design, and her ring can remain sleek and chic. Opt for a polished or beveled edge for added interest. Inlays of blue-green or red opal create a visually stunning band of color. Design the rings to match exactly using the same opal hue or choose contrasting opal hues—like red/green for her or orange for him. The hue of the opal should be complemented by the metal setting, so cooler hues like blue should be set within silvery Tungsten, white gold or platinum. 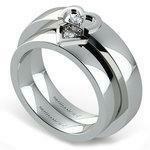 In the past, matching wedding bands favored traditional and simple designs like plain gold or platinum bands. Today, the options for unique matching wedding band sets are numerous, and couples can select amazing inlays, diamond details or even interlocking puzzle rings to create a matching set that matches their love.